Occasionally I get the chance to create a piece of art that is commissioned for a particular purpose or occasion. Once I made a collage time-line of sorts for a client who gave me important photos, memorabilia, and documents from his life to incorporate. It was scary working with such precious things, among them a copy of his birth certificate, weathered and encased in fragments of plastic. He was someone I didn’t know and he didn’t want to influence my design or working process at all — total trust. And that was nerve-wracking. Would he like it? In the end I think he did, or at least he said he did. Once a friend commissioned a piece of art for her wedding; two nesting doves portrayed in scratchboard. The original black and white image was reproduced in purple for the wedding invitations, programs, and t-shirts. Ten years later my friend’s parents commissioned another piece, now for my friend’s tenth anniversary. 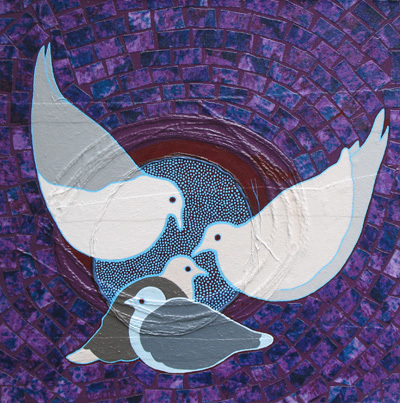 I used mixed-media collage for this one, again in purple. And now the doves have kids. 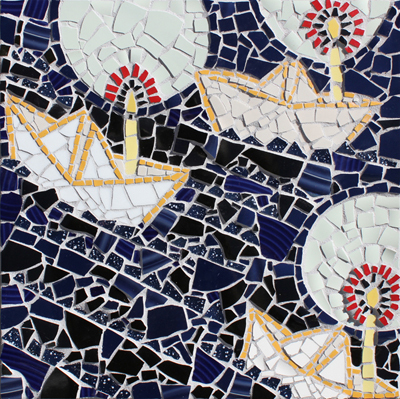 Today I am in the process of making a small commissioned piece in mosaic. The design phase is over, and for me that’s the hardest part of the creative process and also the most satisfying. The finished piece will be a gift commemorating new beginnings in a story that only my client could tell. I’ve enjoyed gathering some of the details of the lives that this piece will honor. 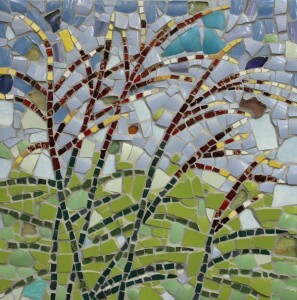 I’ve worked alongside my client to find the right symbol and design: blowing prairie grasses. 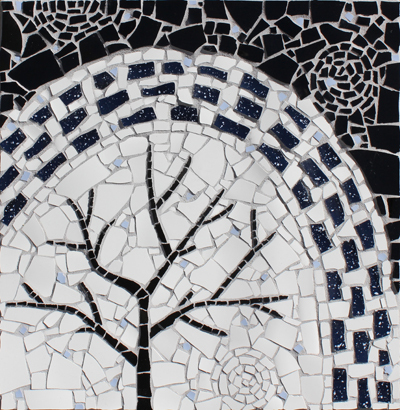 I am using broken shards of recycled dishes to make the mosaic. 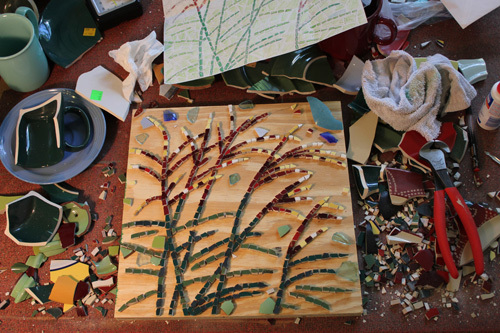 In addition, I’m incorporating small pieces of colored glass, special to my client who picked them up around her farm. I’ll know whether or not the mosaic will come together as a whole only after I grout it and it dries. Grout is the unifier. Grout is good.